Instagram rules engagement, how long before an algorithm? Instagram rules engagement, but how long before an algorithm? 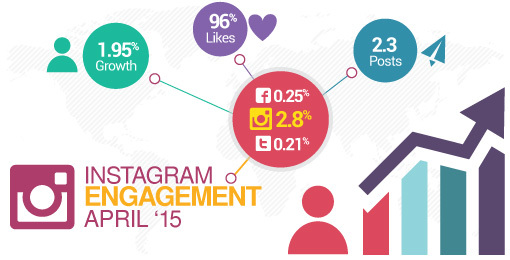 Welcome to the Instagram activity and engagement study for April 2015. For this study we looked at 2,500 Instagram profiles and their performance in the month of April. If you’d like to take a look at the exact data that we used and compare your own Instagram activities against these profiles, do check out our free Instagram Analyser tool. The average follower growth in April was 1.95% of the total audience. Both the smallest and the very largest profiles had above-average follower growth. Profiles with over one million followers had an average follower growth of 2.28%, while those under one thousand followers had growth of 2.31%. All these numbers are organic and show that decent growth is possible to achieve on Instagram, especially when compared to the organic Facebook page growth in April which was 0.18%. The average number of posts per day was 2.3. Of those 89.19% were photos and 10.81% were videos. All across the board the most used photo filter was the normal no filter option. Instagram started with filters being one of the most talked about feature but it turns out that they are not that frequently used. The largest profiles were actually the most active posting 7.24 posts per day on average. Of those only 6.52% were videos. The smallest profiles only posted 1.68 posts per day, of which 95.42% were photos. This could become a trend with brands posting more frequently like they do on Twitter in order to reach more people, grow faster and get additional engagement. This could contribute to more noise and Instagram seems to be working on ways to improve content discovery, which we will look into now. The average engagement per post was 2.81% of the total audience. Engagement levels on Instagram are higher than Facebook which has an average engagement per post of 0.25%, and Twitter which has 0.2% engagement per tweet. For the largest profiles with over one million followers the engagement was 3.2%. Smaller profiles with less than one thousand followers had the highest engagement of 6.01% of the total audience. 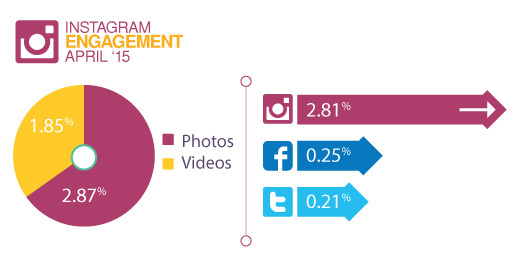 Photos engaged 2.87% of the audience on average while video posts engaged 1.85% of the audience. For profiles with over one million followers, videos performed best – they engaged 3.92% of the audience while photos engaged 3.19%. These numbers are similar to what we saw in our Facebook study for April where videos dominated engagement. This is an opportunity for the large Instagram profiles and they should work on increasing their video output in the future as only 6.51% of their posts are videos currently. Instagram is less noisy compared to Facebook where people could see 1,500+ posts in a day and where Facebook’s news feed algorithm displays approximately 300 of them. Mike confirmed that Instagram is working on ways to help users discover more photos. The first project seems to be the daily highlights email. These activities and future plans will impact the way the feed works. But for now the live, chronological feed works for brands as can be seen in their growth but also in the engagement which we will look at next. 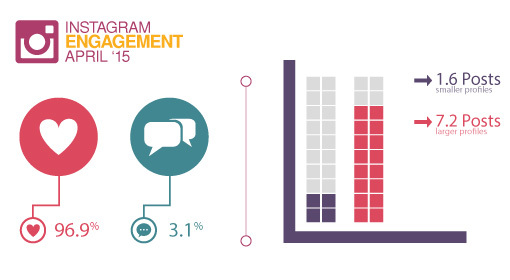 96.87% of all engagements were likes while 3.13% were comments. We see this trend across all social media where the easiest actions are the most popular, for example on Twitter where more than 90% of all interactions are retweets and favourites. Despite only 10.81% of all posts being in a video format, 17.51% of all comments are posted on video posts. Videos give you a better chance of getting more people to comment on your content. What can social media marketers take from this? Organic growth and engagement is still possible on Instagram. If your brand targets a younger and more mobile audience, you should take this opportunity. Photos dominate but there is an opportunity to do more videos. Only 10% of all content is video and numbers from Facebook prove that videos can do wonders for your engagement if done right. How long before we see a change in the way the Instagram feed is displayed? For Instagram to keep the audience engaged and boost the revenue, they might be looking to something similar to Facebook’s newsfeed algorithm in order to better display the more relevant content. That is the big question and it will be interesting to follow the progress. Stay tuned. All Your Social Media Analytics And Reporting In One Place.